China could send astronauts to its space station for more than a year at a time once it goes operational in 2022, a senior project designer told state media. 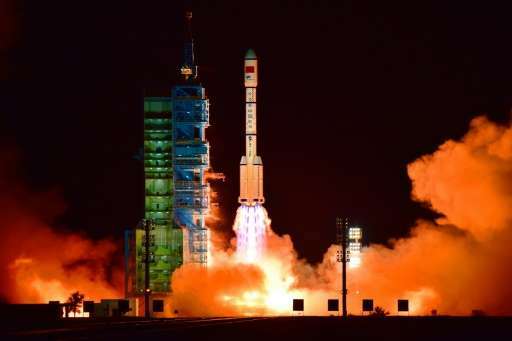 The country's second space lab, the Tiangong-2—or Heavenly Palace-2—blasted off Thursday night from the Gobi desert and is expected to operate for at least two years, the latest stage of the Asia's giant's ambitious space programme. Construction on a space station will start in as early as 2017 and take around three years, before it enters into service in 2022, the official Xinhua news agency reported, citing Zhu Zongpeng, chief designer of the space lab system. Astronauts could be stationed in orbit for missions that last for more than one year in the facility, which has an initial designed life of at least 10 years, Zhu said, according to the report. The longest single stay in space by a human so far is 437 days by Russian cosmonaut Valeri Polyakov. The Chinese space station will weigh over 60 tonnes—much smaller than the 420-tonne International Space Station—and consist of a core module attached to two space labs, Xinhua said. It will normally accommodate three astronauts at a time but has a maximum capacity of six, it added. Beijing sees its military-run space programme as symbolising the country's progress and a marker of its rising global stature. The Tiangong-2 will have two astronauts transported to it to conduct research projects related to in-orbit equipment repairs, aerospace medicine, space physics and biology, atomic space clocks and solar storm research during a 30-day stay, Xinhua said. But for the most part China has so far replicated activities that the US and the former Soviet Union pioneered decades ago. As well as building a space station, it intends to eventually put one of its citizens on the surface of the moon. It announced in April it aims to send a spacecraft "around 2020" to orbit Mars, land and deploy a rover to explore the surface.